Manchester, Manchester University Press, Human Remains and Violence , , 192 p.
Human remains and mass violence outlines for the first time in a single volume the theoretical and methodological tools for a study of human remains resulting from episodes of mass violence and genocide. Despite the highly innovative and contemporary research into both mass violence and the body, the most significant consequence of conflict - the corpse - remains absent from the scope of existing research. Why have human remains hitherto remained absent from our investigation, and how do historians, anthropologists and legal scholars, including specialists in criminology and political science, deal with these difficult issues and confront the implications they create? By drawing on international case studies including genocides in Rwanda, the Khmer Rouge, Argentina, Russia and the context of post-World War II Europe, this ground-breaking edited collection opens new avenues of research through an exploration of these state-of-the-art analyses. Each innovative chapter therefore strengthens the field of genocide studies by providing proper intellectual and theoretical tools for a better grasp of the legacy of mass violence in today's societies. 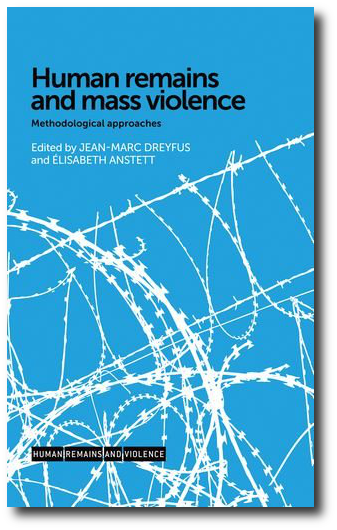 Human remains and mass violence will display that, far from being extraneous, each discipline is able to contribute to this emerging line of enquiry with its own methodological framework and consequently valuable application. Multidisciplinary in scope, Human remains and mass violence will appeal to readers interested in an understanding of mass violence's aftermath, including researchers in history, anthropology, sociology, law, politics and modern warfare. Manchester University Press, Series: Human Remains and Violence, 192 pages. Hardback - ISBN: 978-0-7190-9650-1. £70,00.